IN reviewing the history of social policy through a century and a half of rapid economic change, many factors of general significance have emerged. 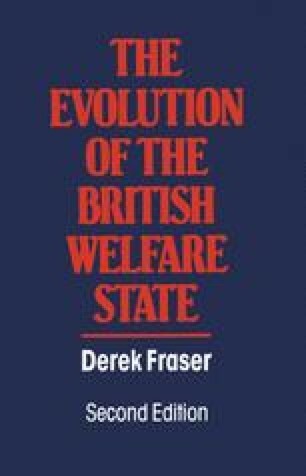 We have noticed how the work of individuals such as Chadwick or Beveridge has vitally affected the course of social policy, and how policy often represented a compromise between individualism and collectivism, between voluntary and state action. A rough relationship also emerged between social philosophy and social policy, the precise mechanism and nature of which remained obscure, yet real; rural paternalism fostered the allowance system; out of individualism grew less eligibility; late Victorian sensitivity to poverty produced the Chamberlain Circular; war-time universalism was the seed-plot for the Beveridge Report. The history of social policy looked somewhat less heroic when viewed from the standpoint of administrative developments, where aspirations often had to be adjusted to meet the power of vested interests. Administrative complexity rather than humanitarianism was the dominant feature of the sanitary legislation of the nineteenth century or the health insurance of the twentieth. He who would master social policy must first master the tangled web of social administration and, as one observer said of a recent Labour Shadow Social Services Minister, ‘Her social idealism should have made this field her forte, but it isn’t. Her mind is not the kind to master the technicalities of pensions at a stroke. Such detail depresses her. Her dearest wish may be to abolish poverty but not by fiddling around with free school milk and family income supplement.